2006; 392 pages. Genre : Animated Non-fiction. 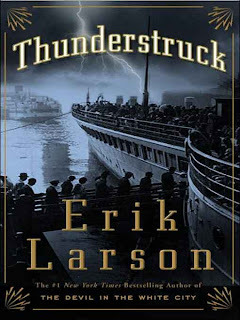 Overall Rating : B.
Thunderstruck combines two stories - one technical; the other sensational. The technical tale tells about Guglielmo Marconi and his work to develop "wireless telegraphy". The sensational tale concerns one Hawley Crippin, a diminuitive henpecked husband who one night decided "Enough is enough", and... well, we'll leave that as a teaser. The setting for both tales is London around the dawn of the 20th century. The tie-in between the two tales doesn't become evident until about 75% of the way thru the book, but it's there. Larson meticulously researches both stories. He includes a separate Notes section at the close of the book, in case anyone wants to check his souces. The whole thing is well-written, and in a unique style. More on that later. The chapters/subsections jump back & forth between the two stories, which some may find confusing, especially since the timelines don't exactly match up with each other. But I've read some Alt History books that try to carry a dozen simultaneous storylines or so (yuck! ), so only two tales is childsplay to me. Larson gives you a fabulous feel for life 100 years ago. This is the third book he's done in the 1890-1910 era, and they all immerse you that period. Also, his character development is top-notch. In their own ways, both Marconi and Crippen are flawed characters. Indeed, you may find more empathy for the latter than the former. To fully enjoy this book, you had better like both the "True Crime" and the "Technical Science" genres. That narrows the target audience down quite a bit. It must be said that Thunderstruck is a slow-read, especially the technical parts. Oh, and a word about the 50 pages of notes. That's a lot of pulp-&-paper used up for the sake of them. Hey Erik, why not post the notes online? 99% of us don't give a hoot, and the 1% that does will hopefully be internet-literate. The Trees thank you in advance. I struggled to think of an apt descriptor for this genre, until I read a review that calls it "animated non-fiction". Ça marche. I've read works of fiction where the author endeavored to make it read like it was real. This is just the opposite : non-fiction where the Larson makes it read like it's a novel. He "invents" dialogue and deduces moods and emotions. Presumably all of this is a consequence of his researching. He employs this same style in his three most-popular books. I don't know of anybody else that uses this format. Of course, I don't read that much non-fiction, so who knows. FWIW, the intertwining tales in the other two books are : The development of the US National Weather Bureau coupled with the killer 1900 hurricane that destroyed Galveston (6,000-12,000 dead) ("Isaac's Storm") ; and the 1893 Chicago World's Fair coupled with a serial killer named H.H. Holmes ("The Devil in the White City"). I recommend all of these, provided that you like the disparate genres. That sounds weird, but interesting. Now I've got an AC/DC song stuck in my head. I listened the the audio book of Devil In The White City. i agree that characterizing the genre as animated non-fiction confuses it with cartoon animation. The style is closer to what Tom Wolfe did in telling the story of the Mercury astronauts in The Right Stuff and of Ken Kesey and the Merry Pranksters in The Electric Kool-Aid Acid Test. Wolf calls it nonfiction narrative in his essay, The Emotional Core of the Story, from the collection, Telling True Stories, edited by Mark Kramer and Wendy Call. Wolfe says there are four technical devices from the novel and short story that are employed in nonfiction narrative. They are scene-by-scene construction, the use of copious dialog, careful notation of status details and point of view. Larson does not use all of them in Devil In The White City, but he uses enough to fit the narrative fiction model. what did you think of The Devil In The White City? Interesting enough to recommend it? Or too many pages of architectural planning before the plot got going? sounds interesting, but I don't know if I would have the patience to read this. I'm up in the air about this one. There were no pages in the audio book version of The Devil in the White City, so I can't say whether it would have been difficult to read. I was able to do other things while I followed the narrative. Given a choice between the Columbian Exhibition and a serial killer who preyed upon young women and debased science, I much preferred the World's Fair. My favorite part was the description of the construction and the debut of the Ferris Wheel. The Exhibition was more than architecture, it was fund raising, politics and the public reaction as well. It was a portrait of that period in American history. It was uncertain whether the planners would be able to pull it all together. When they did, the public reaction was exciting. Then, it all ended in a catastrophic fire.